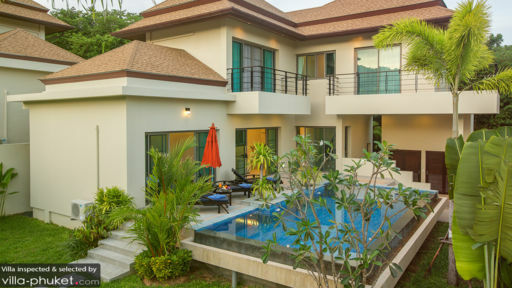 Located in a private villa compound, Villa Siau is a three-bedroom holiday retreat which is a contemporary structure aimed at offering you the best time while you visit the beautiful island of Phuket. 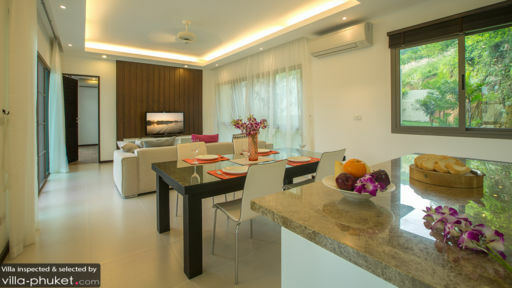 Situated close to Nai Harn beach, the villa provides its guests the luxury to enjoy the beach life without having to travel far from their personal oasis. The walled gardens lend the villa a privacy and exclusivity that is so desirable in these trying and busy times. The master bedroom is one of the more spacious rooms at Villa Siau and is furnished with a king-sized bed which sits directly facing the swimming pool and deck. The glass doors can be kept open to flood the room with a cool, fresh breeze or closed for the air-conditioning to kick in. The room has an en-suite bathroom which is fitted with a soaking bathtub and a large shower area. There are two other bedrooms at Villa Siau and each of the rooms is furnished with king-sized beds and provide connectivity to the outdoors. The air-conditioned rooms have each a private en-suite bathroom outfitted with all necessary amenities! The well-manicured gardens are verdant with tropical foliage and abundant natural greenery adding a rich and tranquil feel to the entire property. Through the gardens, up a flight of steps, you can reach the elevated swimming pool which is too bordered by tropical plants and shrubs. The swimming pool sits snugly between the gardens and a terrace which houses some sun loungers for your convenience. You can relax on them, read a good book, take a nap, or basically catch your breath after a refreshing swim in the pool. You can splash around and rejuvenate while you spend quality time with your loved ones. The lavish living room is located right off the swimming pool and offers direct access to the terrace via a set of curtained, glass doors. The beautiful space is decorated with a contemporary style and is furnished with a comfortable sitting area having plush couches and a flat-screen TV, perfect for spending lazy afternoons, when you just want to stay indoors and not do much! There is a dining and kitchen area as well as part of the spacious living area, and the dining table is placed in the middle of the room. The living room is fitted with large windows to ensure that there is enough natural lighting during the daytime. The air-conditioner can be turned on to keep it cool, on a particularly hot day as well. There is a modern kitchen for the guests, and is fully-equipped for the guests’ use. With a glorious view of the bordering foliage, the living area is a lively and cheerful place at Villa Siau. The services provided at the villa one of the best on the island as they cater to all the needs and requirements of the guests. The kind staff is helpful and will remedy anything that is amiss at the villa during your stay. They will even lend out recommendations for where to go and what to see around Phuket. 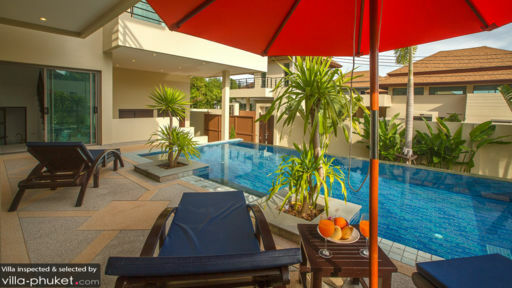 With several beaches like Nai Harn and Rawai beach in the neighbouring areas, the villa’s location could be not have been more appropriate. If you are a foodie, then there are a variety of cuisines on offer in several restaurants in the vicinity!